This quick and easy pork story-fry recipe is not only a breeze to prepare, it’s incredibly delicious! 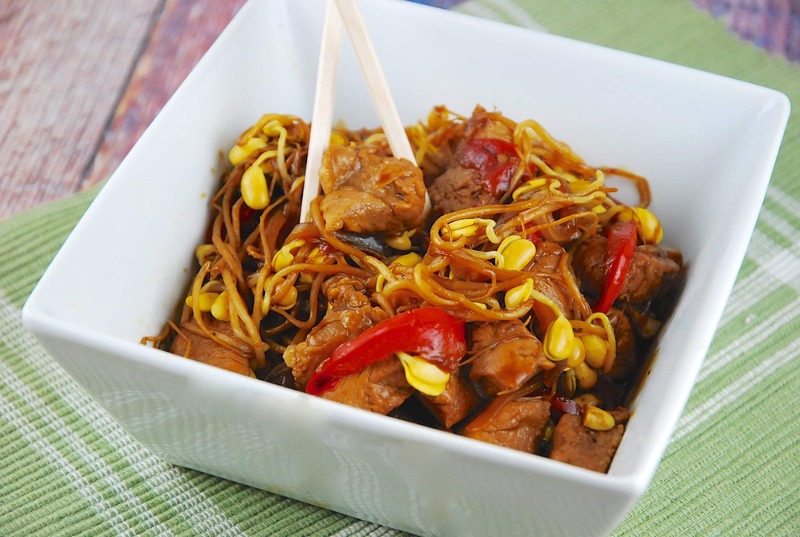 The pork is simmered in a simple, yet flavorful ginger soy broth and is sautéed with bell peppers, onions, and bean sprouts. Feel free to add some other vegetables, as you desire…I just wanted to keep it simple and didn’t feel like doing a lot of chopping. But the Pork Chop Suey works great with water chestnuts, broccoli, carrots, green onions, snap peas and zucchini. You can serve this over noodles, or Miracle Noodles, if you want to bulk it up more too. This delicious Weight Watchers Pork Recipe is always a family favorite around here. Enjoy! Flavorful, juicy and lean, this healthy Weight Watchers recipe is a hit every time. It’s a super quick and easy dish that can be prepared in just minutes, with minimal prep. In a bowl, combine broth, molasses, soy sauce. Mix well. In a small, separate bow, combine cornstarch and 2 tsp of both mixture. Mix well and set aside. Heat oil in a large skillet over medium heat. Add in pork, and cook until no longer pink, about 3-4 minutes, then transfer to a separate dish. Add in onion, bell pepper, bean sprouts, pepper, garlic and ginger, and sauté until fragrant, about 2-3 minutes. *You may want to spray the pan with some nonfat cooking spray first. Pour in broth mixture, and bring to a boil. Cook while stirring regularly for another 4-5 minutes. Now stir in reserved cornstarch mixture and pork, and continue to cook while stirring regularly, until sauce begins to thicken, about 1-3 minutes. Serve immediately. Terrible directions. The writer leaves the sesame oil out all together and directs only half of the corn starch, I got it, but someone less experienced will be looking a bit confused.